Hi all! Hope you had an amazing weekend! Today we’re talking summer dresses in the work place. So you’ve got a closet stocked full with summer dresses they’re probably tube tops, tank tops or spaghetti straps. So how do you make those suitable for the work place? It’s too hot for a blazer or cardigan. What’s your next best option….a vest! And make it a cropped one while your at it. This ripped grey vest from forever is my best friend during the summer months. Here’s a link to Forever21’s vest section. 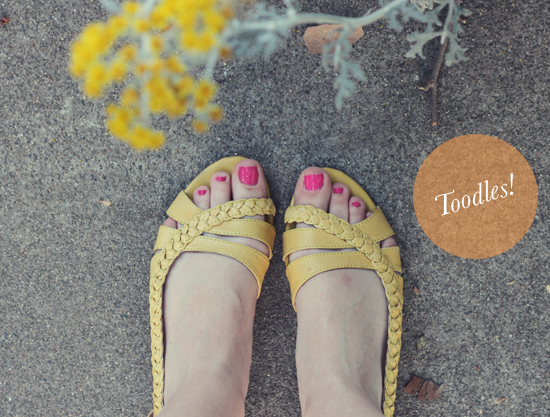 A great way to play down a summer dress is by pairing it with some flats. I found these Seychelle’s marigold yellow flats at Freestyle Clothing Exchange. These puppies retail for around $70, I found them for $10! 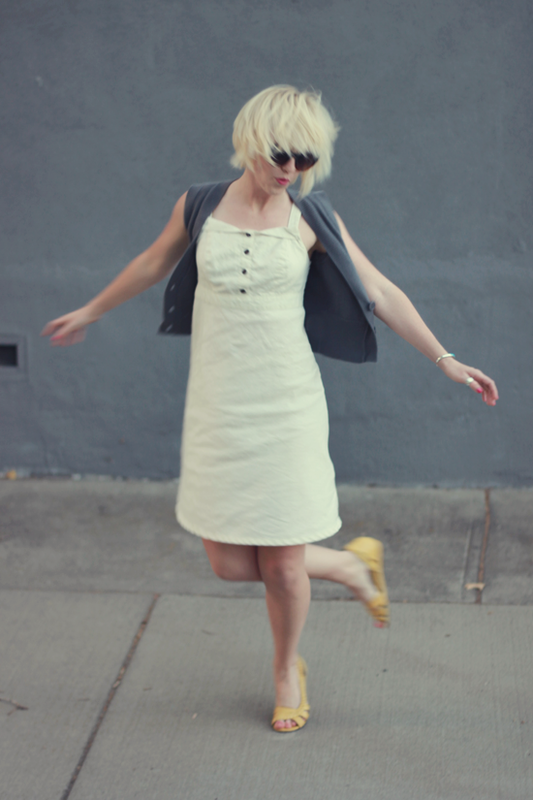 This dress is from Old Navy a few seasons back, it works because it’s just right above the knee. 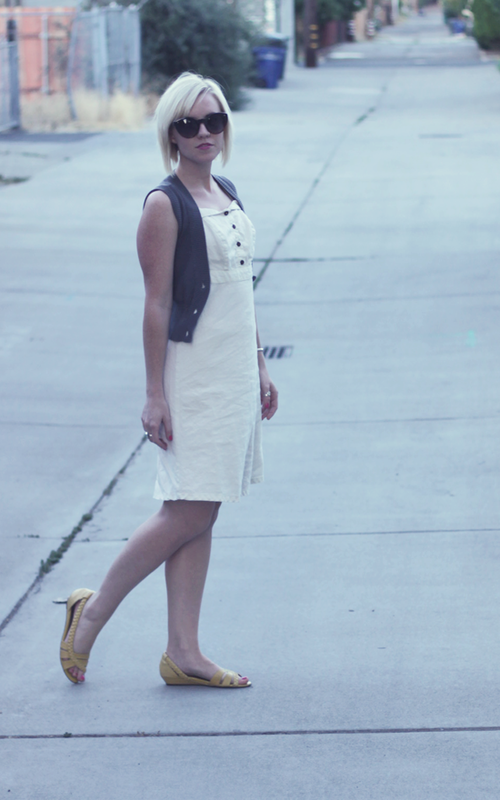 I adore these shoes and love your idea of throwing a vest over a sundress to make it work appropriate! cute dress! love your shoes!! genius about the vest! i totally have a white one almost exactly like that from forever 21 and i would never have thought to wear at that way. gonna try it here soon! Good tip! 🙂 I love the grey/white contrast, with the yellow. Also, I’ve been trying to make time to see Before Sunrise! I heard it’s so good, & it’s nice to hear another opinion on the movie. Ugh I have to have to have to see it! Your dress is darling! I’ve been wearing summery dresses to the office and layering them up with cardis and blazers because the AC is SO cold! But as soon as I get outside it’s bare arms for the drive home! Love your style! This is a great workplace summer look! Love the vest over dress! Cute! umm are you adorable or WHAT?? I adore this dress! It’s so light and perfect for Summer! what a cute dress! and i love those shoes! Love adding on the vest idea! Esp for certain workplaces, u can’t show off too much skin, so wearing a vest on top of ur summer dress is perfect! Love this dress for the work place – appropriate, cute and perfect for summertime! I’m loving those yellow shoes, the braid-like strap is very unique and adds a dressy touch. 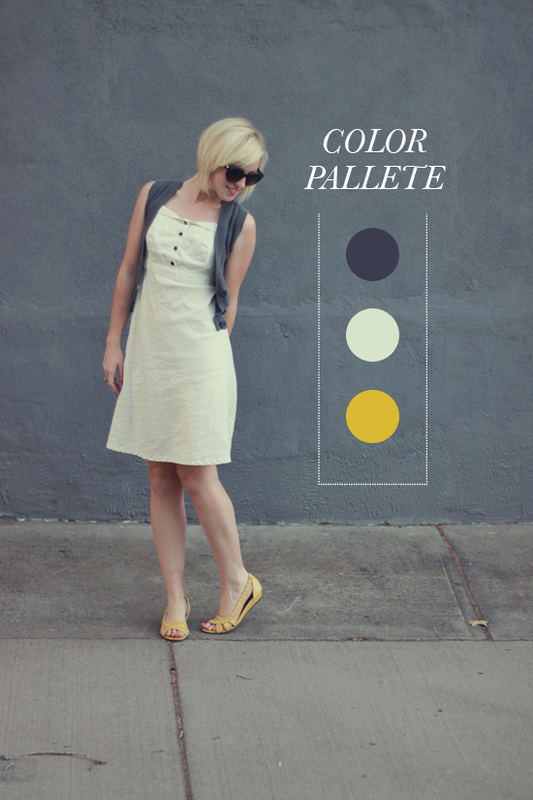 This color palette is perfect for summer! It’s also my favorite color combo. So pretty! I love the idea of putting a vest over a dress for work, it’s genius 😉 You look lovely! Love your site, I’m a new follower look forward to more great tips and outfit inspiration!